What is this branding you talk about? When you see a logo on a billboard you notice it and without thinking, you know who the brand is. Think Coca Cola or Nike or even Tesco. The colours and shapes that are associated with the brand – the visual elements reinforce recognition. Now when you are working on slides for an online course or presentation, you want to keep your brand top of mind. I Thought Less Is More When It Comes To Slides For Courses? And you would be correct. The best slides are plain with minimal branding (but some!) and have lots of images to help retention of the learning. So, What Do You Mean By Brand Your Slides? I mean using your brand fonts and colours and keeping your slides consistent with the visual elements of your branding where possible. For example, for my own online courses I use slides that have my brand colours top and bottom, the headings use one colour and the body text another. Logos are used sparingly as I don’t want to detract from the content – however I have found a way of incorporating the logo into the slide background so that it is not taking away from the messaging. I have a design theme which incorporates my colours as mentioned above. I have a dark blue border at the top incorporating my logo and a turquoise border at the bottom the titles are all in the Orange from the brand and it has the logo in the top left dark blue border. Now you don’t need to have the borders, you could just have a discreet logo top left or use your brand colours for titles, shapes and borders of pictures etc. The choice is yours. However, using some form of branding that helps your learner remember who you are is a good thing! When teaching reinforcement is key. OK – You convinced me, now how do I do this without taking too much time? 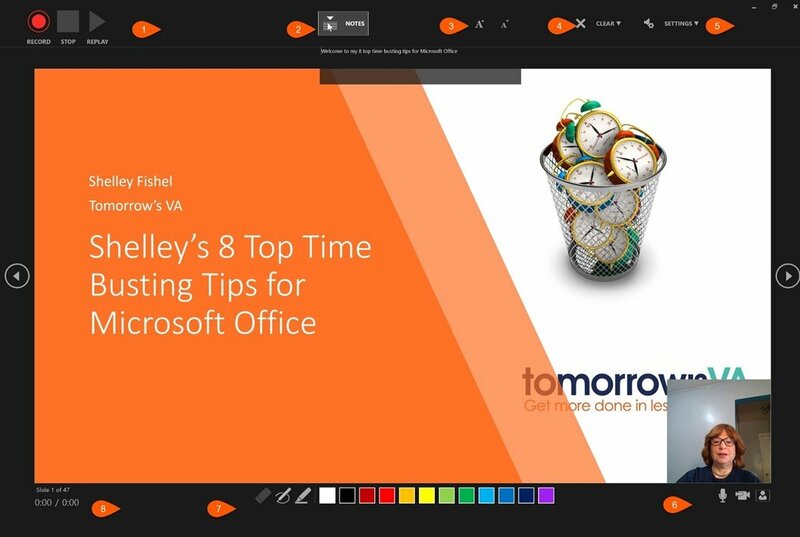 You can of course create a slide in a presentation and keep on duplicating that slide so that the brand elements you set up are on every slide. However, there are problems with working this way. First off you may forget to delete content that exists on one slide and it becomes included in the next one. Then, if the colours and fonts are not embedded within the design, you can easily miss them or use the wrong shade. You may have heard about the Slide Master and wondered what on earth it had to do with you! What does the Slide Master do? The slide master is like a template – for the design elements of your presentations. In the Slide Master you can set the colour scheme, choose which fonts and colours to use in the Headings and body text. What the bullet points or numbers should look like. You can create specific layouts that do a particular job and are always consistent. By setting up the Slide Master to reflect your brand, you no longer need to edit the colours or fonts on the slides themselves. If you also set up the way shapes look and which overall colour scheme to use, then picking colours from your brand palette is a cinch. How do I get to the Slide Master and Make these Changes? In PowerPoint, go to the View Ribbon, choose Slide Master from the icons on offer. Next up you will see all the layouts in the side bar on the left. Here you will find the Master master slide with the number 1 showing and below that all the master slides for each of the different layouts on offer. 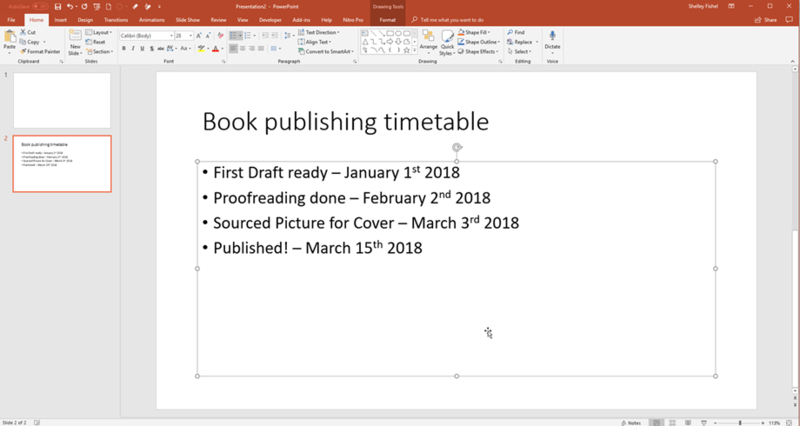 You can make changes to any element on the Master Slide, change the font and/or font colour here, and any new slides you create will have the new fonts and colours. When you are done making changes, close the Slide Master and you will be back in the presentation. Now when you add a new slide, you will be using the new colours and fonts and whatever else you have changed. Can I save this Slide Master to use again? Yes of course! That is the whole point. As an online course creator, you will be creating more than one course – or you may be a virtual assistant that has been asked to put the slides together for an online course creator. This means that you need to have access to this particular slide design again and again with the ability to switch to it fast. The Slide Master is saved as a Design in Windows and a Theme on Mac. 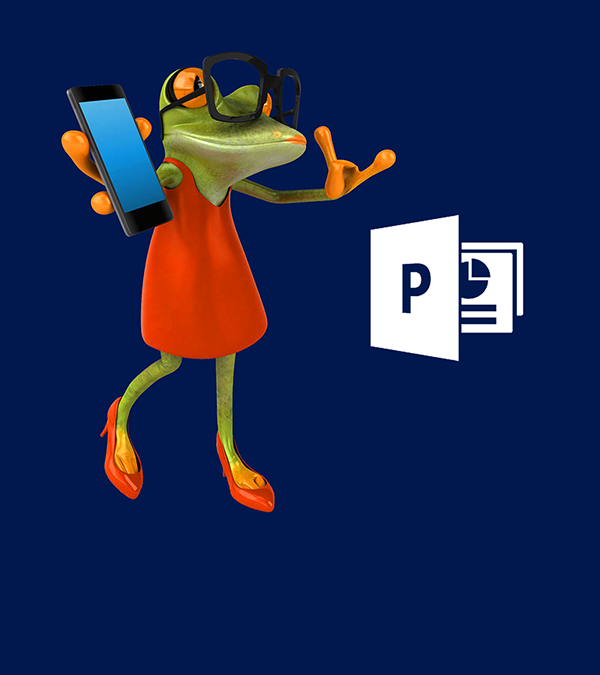 They are saved in a special location on your computer and the next time you open up PowerPoint will be available on the Design Ribbon. How do I Use my new Slide Master? When you start PowerPoint, simply go to the Design Ribbon and select the Design you wish to use. The design will be applied to whatever slides you have, or you can even apply it mid presentation. A template is a master presentation that holds the design and any standard slides you want to use. So, for example, if you always have an opening slide or an end slide, you can create a presentation, apply your course design, create the standard elements and then save it as a template. 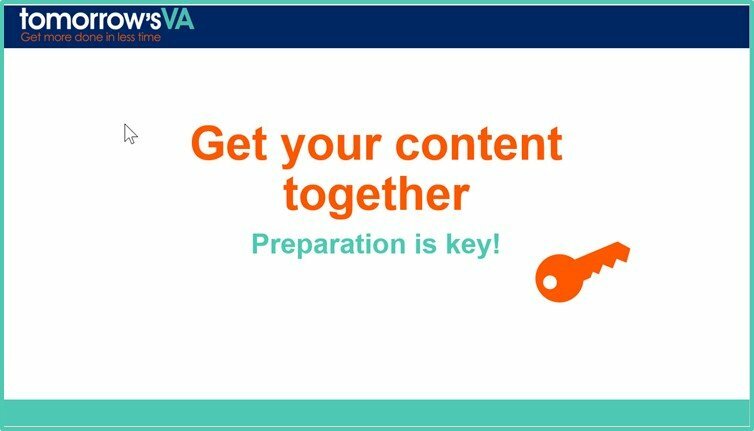 Next time you start a presentation for a new online course, you have the design sorted and need only concentrate on the content of your training! A real time saver I am sure you will agree. To learn more about the Slide Master, you can take my online course called Master The Slide Master. In the course I take you through exactly what the Slide Master is, how to get to it, how to modify it and also how to change the colours so that you are using your brand colours. You will also learn how to create custom layouts and to save both the Design and a template. There is one version of the course for Windows and one for Mac – you can access them here. I also have a couple of ebooks on Amazon (they are included with the course so when you sign up to the course you get the guide too!) if you prefer to learn by reading. 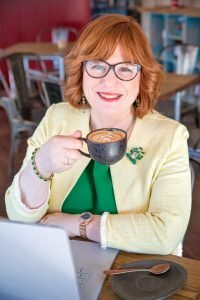 Recently I was asked – How do I record a voice over for my slides? Someone asked this in a Facebook Group I belong to. “What’s a good program for recording audio only for voiceover with slides? Keeping in mind I read with a screen-reader and will be slower as a result, I need something with reasonable recording time that’s not short. Head over to the Slide Show Menu and click the dropdown under Record Slide Show then choose where to start from. To start recording click the Record Button and use the arrows on the right and left to move back and forth through the slides – all the while saying whatever you need to say. 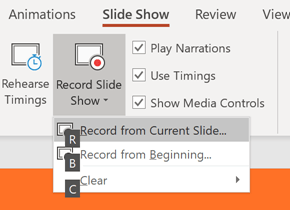 When you are finished click the Stop Recording button and you are taken back into PowerPoint. To see what you have recorded, play the presentation and it will play the slides keeping them on screen for the length of time you had them displayed whilst recording. It will also play any camera or voice recordings so long as you have ticked the boxes Play Narrations and Use Timings. Before you launch into recording, you can Rehearse Timings. This does not actually record your voice but it does record the flow of the slides and the length of time each one is on screen. I like to use this when I am preparing as I can go through and “say” out loud my whole presentation so that I can improve. You can also record as many times as you wish and simply clear the previous recording. How do I Clear the Previous Recording if I don’t like it? Click the drop down next to Record Slide Show. Choose Narrations on All Slides – choose this to clear all Narrations. If you want to clear both Narrations and Timings, go back and choose each one individually. Where can I see Timings? Sometimes you just want to see how long each slide will play for. You can do this by switching to Slide Sorter View. You will see that wherever there are timings there is a star with the number of seconds displayed. Can I change the Timings? 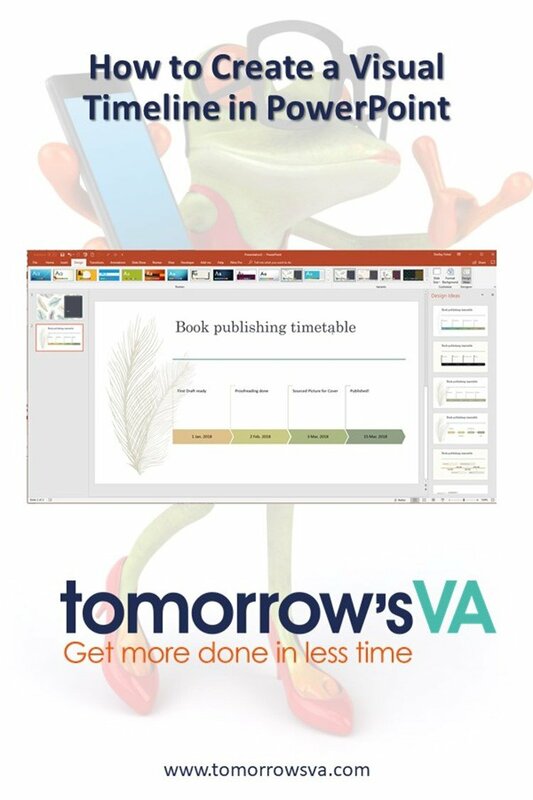 Yes, you can Clear the timings from an individual slide or the whole presentation. Can I record slide by slide? Instead of recording the whole thing and having to go back and forth re-doing the whole thing for one or two mistakes, you can actually record slide by slide. When you do this PowerPoint keeps the recording of each slide and includes it with the rest of the recording. Click the record button to record your narration for the current slide then click Stop recording. Close out of the recorder and then you should see the narration and timing on the slide. If you don’t see the timing on the slide in Slide Sorter view – switch back to Normal View and then go back to Slide Sorter View. The timing will now be displayed. You an also use Keyboard Shortcuts to start the recording. Press the ALT Key to display letters on the Ribbon – you will see each Ribbon gets a letter. 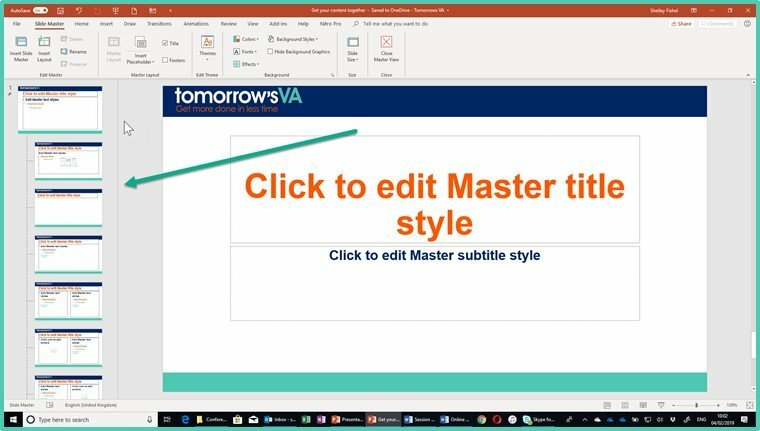 To go to the Slide Show Ribbon press the letter S.
Then press the required combination to start recording either the current slide or the whole presentation. Please leave a comment and let me know if this has solved a problem for you or helped you in any way. As a VA you do a lot of amazing work for your clients. In this post I’ll share with you 10 ways you can create better infographics and speed up their creation. Your first step is to gather and arrange the data in a way that makes sense and tells your story. If the data isn’t right, you may have to conduct a survey to get more data and information that helps you get to your point for the infographic. But gathering and finding the data and collecting it into a cohesive database is imperative. When you find data, don’t assume it’s accurate. Always verify the data before you put it on your infographic. Also, some of the data you find online might be out of date. Check for the most recent source of data so that you have the most up-to-date information on your infographic. Once you have the data, create what is also called a wireframe. This is organizing the data before you add images so that you can see how the information flows. This will also provide ideas for images and for how you might want to display the data. You won’t be able to arrange the information into an effective infographic if you don’t know why you’re doing it. You’ll want to arrange the information with a purpose. For example, if your why is to get your audience to agree with you on a topic (or to engage with you or buy from you), that should be clear from the way you’ve arranged the infographic. When you create the infographic, think about what story you want to tell your audience. If you can tell a story with the data, you’ll help with understanding as well as helping them act on the information. Don’t try to be someone else for your infographic. You want people to see the infographic and know it’s you right away. Know your voice and the tone you want to take in the infographic before you start designing it. When creating an infographic, it is supposed to be visual first. The colors, the images, and the text should all combine to give your audience’s mind a clear picture of what you want them to think about when they look at your infographic. Infographics still have text, of course, but you can be very creative with the text so that it simply highlights and drives a point home that the visual information sets the tone for. Most infographics will be read on a computer screen or mobile device, which means that just like websites you want to avoid using colours that burn people’s eyes and make it hard to look at. Dull the colours some so that the infographic is easy to read and understand. Before letting your infographic out into the wild, ask your closest audience to look at it and give you feedback about it – including how it makes them feel when the look at it. Then, if necessary, make changes. Infographics are great ways to give your audience information, encapsulated in a form that helps them understand the issues and information that you are offering them – more easily than if they just read it in a paragraph. Get our How to Create Infographics Using PowerPoint course to enable you to create infographics fast using software you already own. Creating infographics are a fantastic way to get leads from your website. This is especially true if you get a lot of people to share your infographic and talk about it. This means creating your infographic with lead generation in mind! In this post I’ll share with you 10 things you can do to generate leads with your infographics. Let me know which ones you like the best. * Announce a New Product or Service – An infographic is a great way to talk about any new product or service that you’ve created. You can create a storyboard about why you created the new product or service and then what problems the service solves, while also telling them what to do to get it. * Present Amazing Data – When you’ve collected a lot of great data that helps promote what you offer to your audience, putting it into infographic form will solidify your expertise status enough that you’ll be able to get more leads through that data share. It will make people curious enough to click through to your site and check out what else you offer. * Lead Magnet – An infographic can be a lead magnet. You can gather industry data and create an amazing infographic regarding that data, then give it away to your audience to use as well. Make it editable and brandable, and they’ll be sure to subscribe to access it. * Showcase your Products or Services – A great way to showcase your products and/or services is to make an infographic showing the evolution of your products and/or services, in a way that describes the benefits of the solutions you offer in a creative way. * To Tell Your Historical Story – This is a great use for an infographic, which can go right on the about page of your website. It’s a beautiful way to tell the history of your business, how you arrived where you are today, and how that benefits your audience. * To Make Anything Easy – If you want to show people how to do something in a simple way, make an infographic. Did you know that restaurants often have infographics for each of the dishes they make in the kitchen to help everyone remember what goes into the dish and how it should look? You can do the same thing, which will make you well sought out because of your knowledge – thus increasing the leads you capture based on your infographics. * Create an Actionable CTA – One tip to get more leads from infographics is to remember to include a call to action on the infographic. The branding you add, plus your call to action, is going to make all the difference to whether people simply share it or whether they engage with you in some way. * Sell a Product or Service – You can use an infographic to highlight one product or service, showing all the benefits of that one product or service to the viewer. Make it click through to your shopping cart, and you’re in business. * Get Them to Sign Up for Your Newsletter – A good way to increase leads is to offer something of value in return for something of value from your audience. Ask them to sign up for your newsletter or email list to get more fabulous information, such as what’s in the infographic they’re currently looking at. * Promote Your Brand – Any infographic can be used to promote your brand if you add branding to it such as a watermark for your social media, website link, and more. Everything, from the colors to the tone of voice you use for the information you’re imparting, can make a huge difference. If you want to get leads, the best way to do it is to be consistent in the creation of infographics and then also the promotion of the infographics. If no one knows you created it and you don’t promote it as if it’s one of your best products, it won’t work for gathering leads. Remember, you can take our How to Create Infographics Using PowerPoint course to enable you to create Infographics speedily. Here are 10 ways to ensure that your Infographics are mobile ready. The fact is that mobile devices are what people are using. So if you want people to consume your content, you need to ensure that it works on mobile as well as it works on a PC. This is especially true if you want your infographics to be shared on social media. Instead of making your infographics a long vertical, make them a little shorter and rectangular so that they fit on one average mobile device screen in the first place. That way everyone can look at it on their screens. Thumbnails of the infographic will help with mobile, because it shows a smaller version of the infographic that can be clicked on to go to the landing page where the infographic resides. Instead of making super-big and long infographics, consider making “meme-sized” infographics that explain one point at a glance. These are perfect for sharing on social media. Don’t try to be too elaborate with the infographics that you want to be shared on social media. Instead, make them simple, covering just one topic so that it’s easier to create without a lot of space. Name the file something that tells the search engines and users what it is. Don’t give it a generic name. If the infographic is about how to make ten outfits from the same three pieces of clothing, then say so. One way to ensure that your infographic not only is shared across all social networks but also brings links to your website, is to create a landing page just for the infographic so that it has a home on your site. Use HTML, CSS3, media queries, and any other friendly interactive coding to help the design display according to device correctly. If you create a dynamic infographic, it’ll work anyplace. That way you can design the responsive design to display the right resolution for various platforms, in the way that your audience wants to look at them. You can use flexible grids to organize content so that it can be changed and displayed differently but still understandably on mobile. If you use relative width instead of fixed width, your infographics will look better on mobile. If you understand the breakpoints most systems have, you can design with that in mind, which will help your images look better. Target smartphone portrait mode, and use the right code to display the right size of the devices. Infographics are an amazing way to give your audience information in bite-sized pieces that are easier to understand, due to the visual nature of an infographic. But, they will be shared most often on social media, and you need to understand how each platform will view your infographic and how your audience likes to access your content. You can then design a responsive infographic that gets shared more and is understood well by your audience. 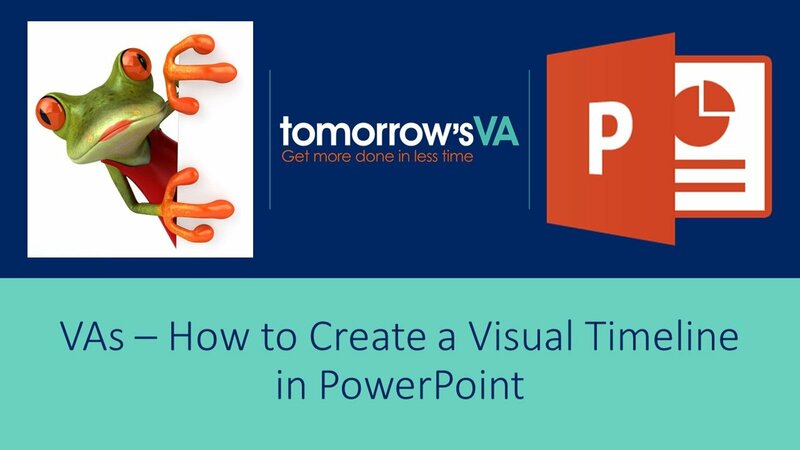 Have you ever been asked to create a timeline in PowerPoint? 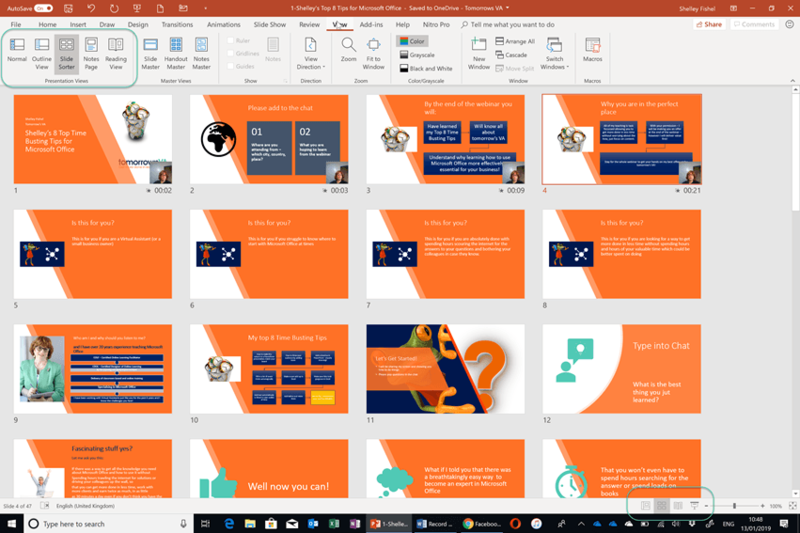 If you have tried to create a timeline in PowerPoint, you probably spent ages, drawing text boxes, and shapes and then formatting it all to look great. 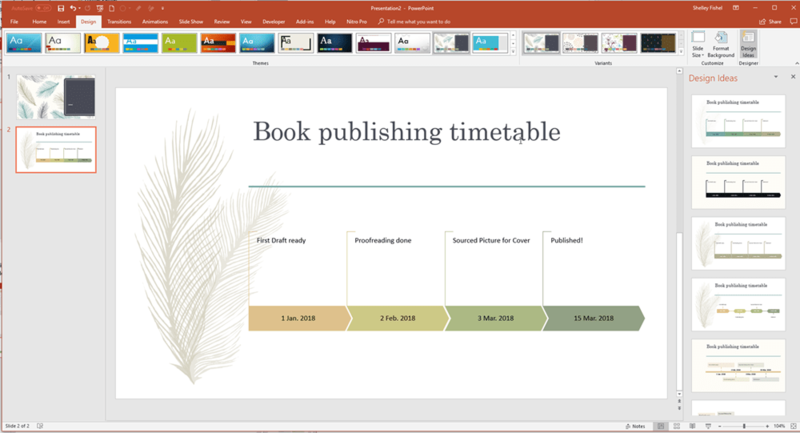 In one of the Office updates, PowerPoint Designer was given the ability to turn a list of dates into a visual timeline. It is fab! 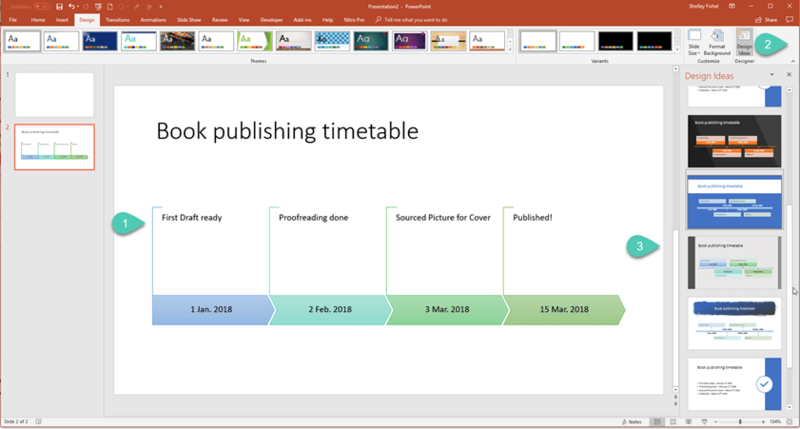 So, how do you create a timeline using PowerPoint? Select the design that you like, and it will change. If you change the theme the design will change to match and you will be offered other designs to choose from. In fact, if you don’t like the first design you have been offered click the Design Ideas button again and some fresh designs will be shown. How will you use this feature? Leave a comment to let me know.